Moving on from the field of Voice IT Management, Mick is now a Business Development Manager with recruitment company TLH Group, allowing him to maintain his commitment to the Wests Magpies and the teams within the football club. With wife Vicki who is teaching Pre-kindergarten at MLC College, they have 2 sons, Todd 34 and Kodi 24. The whole family is involved in the fitness industry through Todd’s fitness centre at Concord, Complete Strength and Performance. His distinguished career as a rugby league player began with the Wests Magpies in 1972 and included stints at Balmain and Umina on the NSW Central Coast, prior to his retirement in 1981. Mick continued his involvement in Rugby League through various roles that included Western Suburbs Jersey Flegg Coach in 1995-96, Metropolitan Cup in 2000 and Junior Representative Selector - New South Wales Rugby League 2003-2009. His current sporting endeavours include regular fitness sessions, golf and surfing. 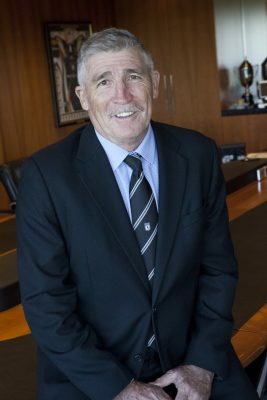 As well as being a Debenture Holder and Director of Wests Ashfield, Mick is also on the Board of Wests Tigers and Chairman of the Western Suburbs District Rugby League Football Club. He remains an active member of the Pratten Park Magpies Past Players Association and a member of the Men of League Foundation. He continues to develop and maintain long-standing friendships and business relationships through his outgoing approach, resulting in a wide network of contacts in both business and sport. Mick brings to the Board a wealth of Wests history, strong business acumen and a welcoming approach.